We are proud to support several local businesses which we believe champion the best of Yorkshire. Our rooms are predominately furnished with Beaver Furniture, a family run business since 1960 and based less than 10 miles from us at Sutton-under-Whitestone-Cliff near Thirsk. The beautiful handcrafted oak furniture is of exceptional character and quality and we have worked closely with David Glegg and his team of craftsmen to help us furnish our rooms and include a few unique bespoke pieces of furniture. Our rooms also feature some of Robert Thompson’s ‘Mouseman’ furniture and accessories too. The Mouseman workshop and visitor centre are also based in the North York Moors National Park in the village of Kilburn, not far from the famous White Horse chalk hill figure. All the furniture is crafted out of English oak and both family businesses mark each piece with a carefully carved miniature Beaver or Mouse. Our rooms are furnished with luxury pocket sprung beds, which are made in Yorkshire by Harrison, the sleep tailors. At Harrison Spinks Farm, a 300 acre sheep farm in North Yorkshire, the sheep are reared in exchange for their woolly fleeces to produce the luxury fillings for their mattresses. With over a hundred years of specialist knowledge and craftmanship we believe that Harrison beds give our customers a good night’s sleep. After all, we are a bed and breakfast business so it is very important the bed is made of the highest quality and offers the most comfort. Our rooms are decorated with small pieces from local craftsmen and craftswomen from the area including Little Wren Pottery in Northallerton and wood vase carvings from Hollow Creations, a workshop which used to be based in Ingleby Arncliffe before closing. The complimentary toiletries in our rooms are from H2K Skin Care in Harrogate, North Yorkshire who provide specialist skin care products which are ethically sound. We are very lucky to have some fantastic local producers which compliment our breakfast menu. Stamfrey Farm in West Rounton supply their organic yoghurt made by milk produced from their herd of organic, grass fed cows who graze the fields only a few miles from us. Our meat comes from the award winning family butchers, Kitson and Sons in Hutton Rudby using meat from local farms. In particular, they produce a fantastic Cumberland sausage, bacon and black pudding for our full Yorkshire breakfast. 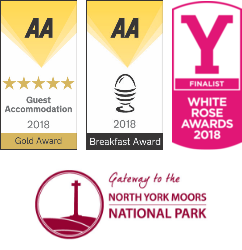 If you visit their Northallerton shop on the high street you will see several trophies and rosettes on display for the numerous awards they have won over the years. Guests are also offered at breakfast the delicious North Yorkshire Honey by Trevor Swales. Swales honey is a family business established in 1975 and produces honey from the North Yorkshire Heather Moors above Osmotherley. Outside the family home is the ‘Honey Hut’ where locals and visitors can buy jars of either their clear golden runny honey, the dark aromatic Heather honey or the creamy set honey. Our eggs come from our next door neighbour’s hens when they can meet with demand! Otherwise, we use James Potter Yorkshire eggs based at Village Farm, near Thirsk.